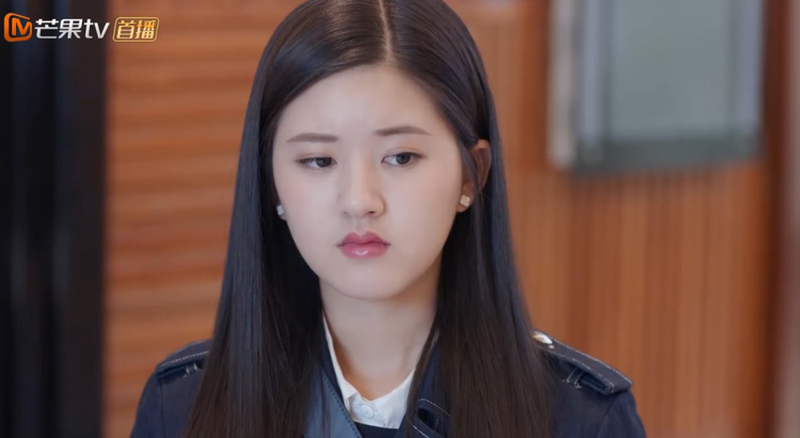 These are recaps of I Hear You Chinese Drama Episodes 3-4, Bei Erduo’s mom is extremely anxious when she knows her daughter resigns and is in relationship with Ye Shuwei. She scolds Bei Erduo for resignation, and thinks Ye Shuwei is just a carpenter who has low salary. Note: From here on out there are specific plot spoilers for I Hear You Chinese Drama Episodes 3-4. Bei Erduo is scared by the scene of haunted house, and jumps to Ye Shuwei. The camera films it and post it on the social media. People envy Bei Erduo has a boyfriend like Ye Shuwei. Ye Shuwei walks Bei Erduo in the haunted house, and she finds out her shoe is missed. He has to return and look for the shoe for her. They walk out, but the Mc asks them to answer three questions, otherwise they have to return to haunted house. The first question is what the background music is. They’re good at music, so they get the right answer. The rest questions they answer them right, and complete the challenge. On the way home, she wants him to take her to the party, but she doesn’t say anything. Bei Erduo steps in the classroom, and the classmates praise her boyfriend. She is awkward. Le Tian helps her to get out of the trouble, and he has a crush on her. Lu Lu visits Ye Shuwei’s workshop, and she has feelings on him. He ignores her and make her sad. The tv station assigns a new assistant Xing Zhen to Yu Sheng, but Li Zi is jealous since Xing Zhen is pretty. Le Tian walks Bei Erduo home, and asks her about Ye Shuwei. She doesn’t deny their relationship. Bei Erduo texts to Ye Shuwei about the party. He agrees and takes her to learn ballroom dance. But she always tramples his foot, and kisses him by mistake. Bei Erduo’s mom is extremely anxious when she knows her daughter resigns and is in relationship with Ye Shuwei. She scolds Bei Erduo for resignation, and thinks Ye Shuwei is just a carpenter who has low salary. Bei Erduo is furious to tear up. When Bei Erduo’s mom is going to take her to leave, Ye Shuwei threatens her to pay the penal sum if Bei Erduo leaves. Bei Erduo’s mom is scared to be silent. He promises that Bei Erduo will become a super star if she continues working at there. Bei Erduo’s mom gives up taking her daughter away, and agrees to let her continue her job. But she still looks down on Ye Shuwei, and wants to get her daughter a rich boyfriend. Bei Erduo cannot stand her mother’s snobbish, and leaves with the excuse of lesson. Bei Erduo likes the figure of the game shop, but she cannot afford it. She peeks at it when she visits, but leaves disappointed. Ye Shuwei walks in the shop and buys the wall of figures because he doesn’t know which one she likes. The shop owner is shocked. Bei Erduo is cheated to go on the blind date. The man mocks the music she likes most. She doesn’t like him, so she calls mom and wants to leave. But mom tells her to stay there. Ye Shuwei wants to give the figures to Bei Erduo, but sees her going on blind date. He is furious, but goes to help her when she dislikes the man. Bei Erduo tells the man that Ye Shuwei is her boyfriend, and she leaves smoothly. Yu Sheng tells Bei Erduo that Ye Shuwei never gets any girlfriend. Li Zi thinks Bei Erduo and Ye Shuwei is the best match. Bei Erduo is moved. Ye Shuwei sends the location of the party to Bei Erduo. But she thinks he wants to have one night stand with her. She remembers he promised to take her to the reunion, and thrills. They attend the archery contest. Bei Erduo is flustered because she never practices it. So Ye Shuwei teaches her the archery skills. Ye Shuwei is good at archery, and gets the good score of eight ring. He asks Bei Erduo to follow her since he has two chances. He gets the bull’s eye, and the Mc thinks he is trying his best for the dancing party. But he only gets eight ring when he peeks at Bei Erduo. It’s her turn. He places his hands on her hands and completes the shoot. When she turns around, he kisses her forehead by mistake. They get the the bull’s eye and nine ring, but they break the rule. So her scores are invalid. Bei Erduo decides to shoot it herself, and gets the zero ring. She smirks at Ye Shuwei. On the way home, she remembers his kiss and has a eye contact. She shakes her hand and thinks she has endocrine disorder. She tells herself to keep distance to him. The mc announces that Bei Erduo and Ye Shuwei get third. They pick the outfit, and return the prom to perform the beauty and the beast. Ye Shuwei tells Bei Erduo to respect her job when she distracts. She asks him what clothes she should wear to the gathering, he tells her to choose it herself. She wears a blue outfit since he likes blue, and dresses up like a male. He judges the outfit that doesn’t look good, and disappoints her as she dresses up according to his taste. Ye Shuwei’s friends don’t expect he got a girlfriend like Bei Erduo, and are shocked. Lu Lu is jealous and tramples Bei Erduo’s shoe, and pretends to compensate. People finds out Bei Erduo and Ye Shuwei were awkward while shooting. People think they’re not in relationship, and the show lies to them. The rumor spreads very fast. Li Zi and Yu Sheng worry about it. She blames Bei Erduo for messing it up. Meanwhile, Bei Erduo offers to take photo together, he doesn’t reject it. Li Zi takes Bei Erduo and Ye Shuwei to the love hotel, and opens a room for them. She will take photo when they get in the room, so people will know they’re couples. Bei Erduo agrees it after Li Zi kept persuading her, and tells herself that it’s just acting. Li Zi asks them to get in the hot spring to make it more reliable. When Bei Erduo hesitates, Ye Shuwei hugs her, and the reporter shoots what he wants. She sees the chairman’s daughter who got her position fighting with a man in the hot spring. Bei Erduo realizes that she misunderstood Ye Shuwei because that woman isn’t his girlfriend. She wonders why he didn’t explain it, but he says it’s too troublesome to explain it. Please write the next update fast!! Yup i want them too. Please give other recaps of the chinese drama i hear you 2019.